Q. What is a radical nephrectomy ? A radical nephrectomy is a procedure to remove cancer in and around one of your kidneys. The surgeon removes the kidney, ureter (the tube connecting the kidney to the bladder), and surrounding connective tissue, lymph nodes, and adrenal gland. Q. What are the different kinds of Nephrectomy procedures ? Partial Nephrectomy or Hemi-Nephrectomy - In this procedure, a small part of one kidney is removed. Simple Nephrectomy - In this procedure all of one kidney is removed. Radical Nephrectomy - This procedure involves surgical removal of one kidney along with the neighbouring adrenal gland and lymph nodes on the same side. Bilateral Nephrectomy - This procedure entails surgical removal of both the kidneys. Unilateral Nephrectomy - In this procedure only one kidney is removed. Q. Who is an ideal candidate for Radical Nephrectomy ? If you have renal cell carcinoma (stage I, II or III) of kidney or polycystic kidney disease that has completely damaged your kidney tissue then you are an ideal candidate for Radical Nephrectomy. Q. When is it used ? This procedure is done to remove cancer in your kidney or ureter. Q. How do I prepare for Radical Nephrectomy ? It is extremely crucial for your surgeon to assess your kidney function before Radical Nephrectomy. A thorough physical examination, ECG, chest x-ray, complete blood profile, complete kidney profile, pulmonary function tests, blood gas analysis, blood typing and cross matching is done in case transfusion is required during Radical Nephrectomy surgery. Specialized tests like intravenous pyelography, Cystoscopy / Ureteroscopy, retrograde pyelography, cystourethrography, CT scan, ultrasonography, MRI, renal angiography and renal venography will be performed for complete anatomic assessment. You will be hospitalized at least one day before the surgery. Inform your surgeon about your other health conditions and medications (including all the prescription, non-prescription medications, nutritional supplements i.e. vitamins, minerals and herbal products). Refrain from taking aspirin or Ibuprofen at least 2 weeks before Radical Nephrectomy. Stop smoking a few weeks before Radical Nephrectomy to prevent healing problems during recovery period. Do not eat or drink any thing for at least 10 - 12 hours before the Radical Nephrectomy surgery. Q. What does the procedure for Radical Nephrectomy involve? Radical Nephrectomy is performed under general anesthesia. Radical Nephrectomy can be performed either by Open Abdominal approach or Laparoscopic approach. Abdominal approach can be anterior subcostal (incision runs on the front of the abdomen across the rib cage), thoracoabdominal, or flank (on the side) approach. The kidney is dissected free of it's attachments. The renal artery and vein are dissected and cut, ureter is cut and the adrenal gland is freed and removed along with the kidney. A drain will be left in and the wound will be closed. Laparoscopic Radical Nephrectomy is a minimally invasive procedure in which the kidney is removed by making four small incisions (each about 3 inches wide). Surgical instruments are used to free the kidney from it's surrounding structures and the kidney is removed through an incision in the front of the abdominal wall below the navel. The renal artery, renal vein and the ureter are then tied off and the incision is sutured. Radical Nephrectomy when using abdominal approach can take up to three hours. Laparoscopic Radical Nephrectomy can take a little longer. Q. What happens after the procedure? You may stay in the hospital for about 4 to 7 days. 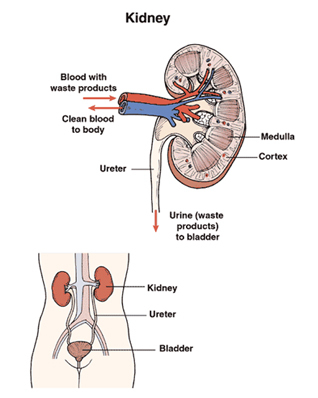 A catheter (tube) remains in your bladder for about a week to allow urine to drain and relieve the pressure. You may have a tube in your chest for 1 to 4 days if part of your incision is in the chest. During the first 2 weeks after the operation, you will be encouraged to do light activity, such as walking. Avoid all heavy activity for the first 6 weeks, including lifting. After that time, you may gradually do heavier work according to your health care provider's instructions. Ask your health care provider how to care for yourself during your recovery. Ask when you should come back for a checkup. The outcome of Radical Nephrectomy depends on the size and type of the cancer. The survival rate for stage I Renal Cell Carcinoma (RCC) following Radical Nephrectomy is 93%. This is for the tumour that is confined to the kidney and has not spread to the outside tissues. Q. What are the benefits of this procedure? Q. What are the risks associated with this procedure? There are some risks when you have general anesthesia. Discuss these risks with your health care provider. The pancreas may be injured during this operation. The nerves in the area of the incision may be damaged either by pressure or by being cut. This could cause the side of your abdomen to sag. You could (temporarily or permanently) lose the feeling in the area around the incision. Urine may leak from the cut made in the bladder. The surgeon may not be able to remove all of the cancer or the cancer may come back. You may have infection or bleeding. Your kidney function will be tested before surgery. If your remaining kidney is weak, your health care provider will discuss this special risk with you before surgery. You may need dialysis, a technique that separates wastes from your bloodstream. You should ask your health care provider how these risks apply to you.